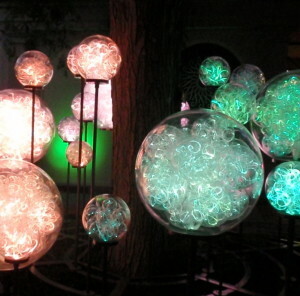 An expansive light exhibit by Bruce Munro at Longwood Gardens helped break attendance records this year. No resting on its laurels for Longwood Gardens: After reaching a milestone of 1 million annual visitors in mid-August, it continued to achieve record attendance. Gardens officials announced today that the fiscal year – from Oct. 1, 2011, to Sept. 30 – attracted 1,163,392 guests. “We are thrilled to reach this attendance milestone and are pleased that so many people from around the region and around the world want to experience the beauty of Longwood Gardens,” said Director Paul B. Redman. Officials attributed part of the increase to “Light: Installations by Bruce Munro,” a dazzling exhibition that drew nearly 300,000. Those who missed the show, which is not scheduled to return, should ensure they attend whatever attraction takes center stage next summer. In the meantime, the popular Chrysanthemum Festival opens Saturday. It runs through Nov. 18, and the holiday lights show will follow soon after. Longwood Gardens began as a tree-saving initiative by industrialist Pierre du Pont, who purchased a small Kennett Square farm to save some historic specimens destined for the lumberyard. Years of indulging his passion for horticulture created the 1,077 acres of displays enjoyed by well over a million this year alone. The gardens, located on U.S. 1 near Kennett Square, are open daily. For more information, visit www.longwoodgardens.org or call 610-388-1000.